Scones are delicious, tender, crumbly pastries often served for breakfast. They are also one of the worst breakfast options available. Most scones are loaded with saturated fat and unnecessary calories. 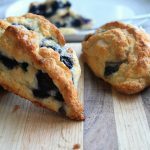 I wanted to create a scone that contained less fat than typical recipes while still maintaining the integrity of classic scones. Most scone recipes call for whole milk, butter and/or shortening and sour cream. My goal was to decrease butter content, swap whole milk for lower-fat milk and eliminate the sour cream all together. I needed to make sure that the changes and substitutions were well balanced in order to create a crunchy outside and tender inside. Adjust oven rack to middle position and heat to 425°F. Line baking sheet with parchment paper and set aside. Grate 4 tablespoons of frozen butter on a large-hole grater. 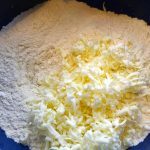 Place grated butter in freezer until needed. Place blueberries in freezer until needed. Whisk together milk and Greek yogurt in medium bowl; refrigerate until needed. Whisk flour, sugar, baking powder, baking soda, salt, and lemon zest in medium bowl. 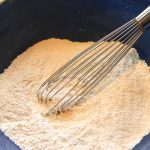 Add milk mixture to flour mixture and fold with spatula until just combined. Transfer dough to a well-floured work surface. Dust dough with flour and knead dough 8 to 10 times, until it forms a rough ball, adding flour as needed to prevent sticking. Roll dough into a rough 12-inch square. 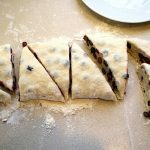 Fold dough into thirds (like a letter). Lift ends of dough and fold into thirds again to form a 4-inch square. Transfer dough to plate lightly dusted with flour and chill in freezer 5 minutes. 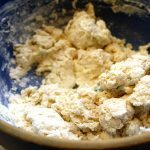 Remove dough from freezer and transfer to a floured surface. Roll into an approximate 12-inch square again. 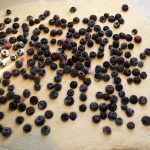 Sprinkle blueberries evenly over surface of dough and lightly press them into dough. Using a scraper, carefully release dough from surface. 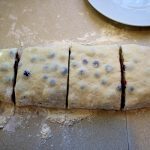 Roll to form a tight log, jelly roll style. Lay dough seam-side down and press into a 12×4-inch rectangle. Using a sharp knife, cut log crosswise into 4 equal sections. Cut each rectangle diagonally to form 2 triangles. 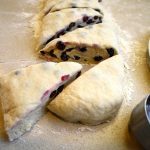 Transfer scones to parchment-lined baking sheet. Melt remaining 2 tablespoons of butter and lightly brush tops of scones. Lightly sprinkle with turbinado or coarse sugar. Bake until tops and bottoms are golden brown, 20-25 minutes. Transfer to wire rack and cool before serving. Per scone: 280 calories, 6g fat, 63g carb, 2g fiber, 17g sugar, 5g protein. Recipe Note: One of the most important aspects of this recipe is keeping all of the ingredients cold. 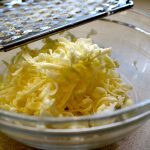 It’s essential for the shredded butter to be kept frozen because it disperses better into the dry ingredients and maintains a flaky texture in the baked product. It’s also very important to move quickly when working with the dough; the less you work with it the better of a product will be produced.